The Wood Brothers Racing Team has been one of the backbones of NASCAR since the sport was founded. The Woods, from Stuart, Va., have been racing continuously in the division now known as Sprint Cup since 1953 and have 96 wins to their credit. In a RacinToday exclusive series, Eddie Wood, one of the second-generation members of the team, will choose what he considers the top 10 wins in Wood Brothers history. The wins aren’t ranked in any particular order. This week’s entry recalls the team’s triumph in the Motor Trend 500 at Riverside International Raceway on Jan. 23, 1966. Over the years, the Woods have been best known for their successes on the superspeedways of NASCAR, but when it came to NASCAR-sanctioned road racing in the 1960s, the Virginia brothers – Glen, Leonard, Ray Lee and Delano – headed up an outfit that was essentially unbeatable. The first show of strength was in the season-ending Golden State 400 at Riverside in November of 1963, when Dave MacDonald drove the No. 21 to a strong second-place finish behind Darel Dieringer after the two swapped the lead throughout the race. And MacDonald was able to secure his spot even though he lost third gear, his highest, midway through the race. Glen Wood said MacDonald had the presence of mind to back off the gas when the RPMs got too high on Riverside’s long backstretch. In that same race, Marvin Panch drove the second Wood entry, finishing third in the No. 121. In their next Riverside run, on Jan.19, 1964, the Woods put Dan Gurney in the 121. Glen Wood recalls that Gurney’s reputation in NASCAR land was one of a driver who was difficult to work with. But their experience showed the opposite to be true. Wood said Gurney was a smart racer who knew what he wanted in a car and expected the crew to provide it. The Woods had no problem with that. Wood said the Holman-Moody crew members who had worked with Gurney in the past said he was hard to please about things like the placement of the seat. Wood said it was no big deal to accommodate him. “Dan was tall and long-legged and had to have the seat moved way back,” Wood said, adding that the crew moved the seat back a good bit before Gurney ever tried it. “It wasn’t too far off to start with, and we moved it just a little before we got it right,” he said. Once Gurney sat in the car, he surprised the Woods by practically standing up on the brake pedal. Wood said Gurney and Leonard Wood made a great pair when it came to preparing the car. “Dan was right there with Leonard to discuss things,” he said. In his first start with the Woods, Gurney dominated the 1964 race and won over Panch in the Woods’ No. 21. The Woods also carried the No. 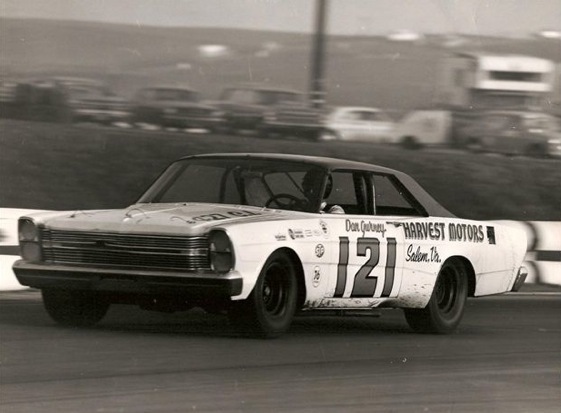 22 of Fireball Roberts to Riverside that year and he gave the brothers a 1-2-3 sweep of the finishing order. But that feat was marred by the fatal crash of a former Wood driver, Joe Weatherly, the reigning Cup champion, who died in a crash of Bud Moore’s No. 8 Mercury. In 1965, the Woods won again at Riverside with Gurney in the 121 and Panch third in the 21. But from a pit crew standpoint, the 1966 race topped them all. The Woods took three cars to Riverside that year, the 121 for Gurney, the 41 for Curtis Turner and the 21 for Panch. Gurney and Panch were proven road racers and Riverside veterans. Turner had plenty of experience driving fast on winding roads, but most of it was back in the days when he was hauling moonshine whiskey. He’d never seen Riverside until he showed up to drive the No. 41. During the opening practice session, Glen Wood took a position near the esses, so he could assess Turner’s road-racing skills. It was a sight to see, he said. “Before he came off the track, he set a new track record,” Wood said. David Pearson, in Cotton Owens’ Dodge, won the pole, but the Wood drivers took the next three spots. During the race, Gurney and Turner swapped the lead several times, but Turner’s bid for the win was undone by a mix-up on pit signals. Leonard Wood, in the days before two-way radios, walked beside the track and gave Turner the universal signal for a driver who has a big lead – two outstretched hands. Then he dropped his hands and walked back to the pit area. Turner, thinking the signal meant for him to pit, stopped on the next lap. Then, in his effort to make up for lost time, he spun off the course several times. At one point in the race, Gurney, sensing that Turner’s aggressive driving might crash them both, let his teammate go when the racing got too tight for his comfort. It was a decision that eventually led to him taking the checkered flag, while Turner rallied to finish fourth and Panch dropped out with transmission trouble. Wood said Gurney proved a point that remains true to this day – there’s a time to race a competitor and a time to let him pass you. “Sometimes you just have to let folks go,” Wood said. Another aspect of that victory is still true in racing to day – it’s easier to make up time on pit road than on the race track. According to the account of the race in Greg Fielden’s “Forty Years of Stock Car Racing” Gurney’s total time in the pits during six stops was two minutes. Second-finishing Pearson made seven stops for a total of three minutes and 51 seconds. Glen Wood said one of their advantages back in the day was that they put more emphasis on pit work than their competitors. “We practiced pit stops more than most of the teams,” he said. The Woods returned to Riverside in 1967 and worked the pits for Parnelli Jones and his Bill Stroppe-owned Ford, running their Riverside win streak to four. Then in 1968, Gurney was back behind the wheel of the No. 121. He scored his fifth overall Riverside win, while the Woods got their fifth straight. So what year and race is this car of Dan Gurney in the #121 pictured above from? I know for sure it is not his 1965 Riverside Winning car. That car was all red. This is the Red and White. What year and race is this picture from?